While there is no road map to managing the after crisis of one of the worlds most damaging disasters, the critical 20 year experience of Global Empowerment Mission and the local expertise of Paradis Fire Adopt-A-Family is currently identifying the most critical areas of need and directly responding to ensure the most expedited and progress is made in the shortest time period. GEM and Adopt-A-Family have created a application vetting process to identify those with the most critical needs and address those needs with the specific requirement of the individual or family. 50,000 people have been displaced or homeless due to the fire that burned down the towns of Paradise and Magalia California and several surrounding communities. On November 8, 2018, the deadliest and most destructive wildfire in recorded California history, The Camp Fire, destroyed most of Paradise and the adjacent Concow communities killing at least 85 and leaving 50,000 people displaced and homeless. The Camp Fire burned more than 153,000 acres and destroyed over 18,000 structures including home, businesses, commercial structures and the vital infrastructure.Global Empowerment Mission is the official partner of Paradise Fire Adopt-A-Family initiative and is currently working together to provide housing, trailers, tool and assistance to residents in need.Over 18,000 structures were fully destroyed. This includes residential homes and many businesses. As residents ponder the option of relocation or rebuilding their destroyed business, this program will encourage the community that employment and economic growth is on the rise. This will inadvertently give hope to so many.GEM has been on the ground serving the victims of Paradise within 48 hour of the wildfires. GEM has made 3 mission trips to date and continuing. Delivered over 2000 BStrong cash gift cards, an 18 wheeler of aid and 2 full size aid trucks, 1000 Children’s respirator masks, hosted Thanksgiving Day dinner and Christmas Day banquet and events distributing donated toys to over 800 children. Our immediate solutions are to assist the families in getting housing with trailers, purchase tools for survivors so they can get back to work, provide cash gift cards to help people cover food costs and gas costs, providing funding to other nonprofits that can help with our outcomes, providing loans to help small businesses get back up and running, provide funds to help people relocate or rebuild their homes and provide therapy to help people deal with the stress and trauma they have experienced. By providing support we will positively affect the community. Our solution is to help one family at a time. Each family that we help get out of a shelter or tent and into a trailer or temporary housing. Each person we get back to work by providing aid and tools it gets them closer to sustaining themselves and rebuilding business.Each person we can help with therapy, it will help them think clearer so that they can create a plan to move forward. Each small business we help get back up and running helps create jobs and improve the economy. Each family we help relocate helps reduce the housing burden in the area and stabilizes that family. Our organization does not receive funding from the government, so we rely entirely on in-kind donations and gifts from private organizations and individuals. 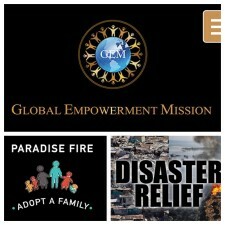 Global Empowerment Mission invites you to become our partner in helping change the lives of the victims of The Wild Fire. We sincerely hope that you can join us to transform lives of these disaster victims. GEM has been on the ground serving the victims of Paradise within 48 hours of the wildfires. The survivors have lost their community, businesses, homes, cars, personal belongings and many are still in shelters, tents, living in cars or temporary housing. We need your support to save this community. Michael Capponi is the founder of Global Empowerment Mission, Inc. GEM has been dedicated to supporting and providing critical disaster aid relief to the most significant global tragedies over the last 2 decades. GEM is a 501c3 nonprofit charity. GEM is on the ground serving victims of Paradise. "California Wildfire Victims Relief Aid,"